Okay, Which One Of You Tweeted Something Mean At Kevin Durant? Someone better fess up. Kevin Durant was being grumpy about Twitter today. Which one of you said something mean to him, you jerks? "Oh well." We know what's going on here. 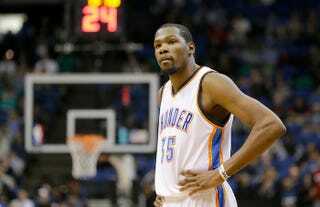 Someone come forward and say sorry to Kevin Durant. Was it you, Lil B?